Anyone who has visited us in the port knows that a large, empty building — site of the former Dijon General Hospital — sits all but across the street from our mooring. 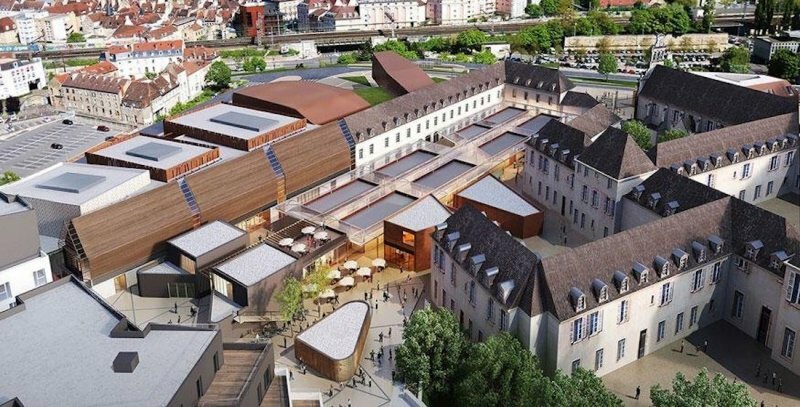 We’re excited that the city of Dijon has chosen this beautiful complex will host the Exhibition Center, making it easily accessible for guests joining us on our Burgundy canal cruises. The International Gastronomy Exhibition Center will have numerous attractions that will entice visitors to the area. Courses from the Ecole Ferrandi school, focusing on pastries and cooking, and the BIVB wine school will be featured in the educational center. Elsewhere in the complex, a movie theatre, a small residential neighborhood, and a four-star hotel will sit alongside restaurants, wine bars, and cooking-centric boutique shopping. This development offers our guests numerous opportunities whilst visiting Dijon. The hotel allows for convenient accommodation before or after cruising, for those interested in remaining in Dijon; the various wine bars may make for a great stop on our evening pub crawl for interested guests. We can’t wait to share this new local attraction when it debuts in 2019!